After five cold, damp days without electricity, heat, phones, and Internet, I will never again daydream about life on the frontier. No more pioneer woman fantasies for me. Last week’s freakish, devastating October snowstorm left me perfectly happy to live in the present – electric coffee pot at my side. All those long days of scrounging around in my pantry for food I could heat up in the dark (by holding a match to light the gas burners on my stove top) left me hungry for food that I could cook and bake in my electric oven. Even though I was grateful for a couple of defrosted containers of homemade pea soup (which had to be eaten very quickly before they spoiled), I wanted long-cooked food and delicious aromas. I wanted people coming into the kitchen (a warm kitchen) with their noses sniffing the air. On Sunday, after catching up with a week’s worth of chores in 48 hours, I made tender, succulent short ribs and chocolate fudge cake. But unlike those pioneer women of yesterday, I made mine with electricity. The short ribs took several hours to cook and made us grateful the oven was working. The chocolate cake made us excited. I don’t usually make chocolate cake just for the heck of it, but we needed something special. We needed something to look forward to. Chocolate cake is all about home and comfort and smiles. And after a week of seriously pared down living, my family needed all three. Sous chef boy was a happy camper. My gluten-free chocolate cake is a classic and it’s been in my repertoire for a long time. (It’s appeared in the first edition of Gluten-Free Baking Classics in 2006 and on Foodphilosopher.com in 2004.) Even so, I’m always surprised at how easy it is to get it into the oven and by how good it tastes. Sometimes I like to frost it with a buttercream or a rich ganache. But on Sunday and I wanted (and needed) to keep it all very simple. I made a light frosting of chocolate whipped cream, and sprinkled on homemade some chocolate shavings. Sous chef boy circled around me and offered up advice about exactly where to put the shavings (he called it “shaving placement”). Then he graciously offered to carry the finished cake down to the extra refrigerator in the basement (ha! he was really doing it so he could swipe a taste without being noticed). When we were cleaning up after dinner, I thought about the electricity, the heat and the food that we took for granted in our day-to-day life. And then I thought about how lucky I am that I can make a gluten-free chocolate fudge cake. It tasted good. It tasted so good that I probably won’t wait until the next time we lose power to make it again. If your mouth has been watering for an old-fashioned chocolate layer cake, then here is just the thing: moist and dense but not heavy; rich and fudgy, but not too sweet. If you follow these easy directions, you can whip up this cake in no time. Even better, no one will be able to tell it is gluten-free. You can make it for a special celebration, use the batter to make cupcakes for birthday parties (bake about 20 minutes), or make it just because you’ve been craving a fabulous piece of cake. Pour yourself a cold glass of milk or a hot, steamy cup of coffee and dig in! Makes two 9-inch rounds or 24 cupcakes. Recipe can be cut in half. 1. Preheat oven to 350ºF. Position rack in center of oven. Line two 9-inch round layer cake pans with parchment or wax paper and spray lightly with cooking spray. (If you use dark cake pans, you may have to reduce temperature of oven). 2. Melt chocolate in small, heavy saucepan over low heat, stirring constantly. Remove from heat and cool until lukewarm. 3. Put flour, cocoa powder, baking powder, baking soda xanthan gum and salt in medium bowl and whisk until thoroughly combined. Set aside. 4. Place canola oil and milk in a liquid measuring cup and whisk until thoroughly combined. Remove two tablespoons of liquid and discard. Set aside. 5. Beat sugar and eggs in large bowl of electric mixer at medium speed pale yellow and thick. Blend in melted chocolate and vanilla. Add dry and wet ingredients in two additions at low speed, then mix at medium speed for 1 more minute. (Do not overbeat or cake will sink in the middle). 6. Pour batter into prepared pans. Place in center of oven and bake for 30-35 minutes or until a toothpick inserted in the center of a layer comes out clean. (18-20 minutes for cupcakes). 7. Cool cake layers in the pans on a rack for 5 minutes. Use a small knife to cut around pan sides to loosen cake. Invert cake layers onto a rack, peel off paper, and cool completely. 8. Place one cake layer on a platter. Spread about 1 cup of frosting over top and sides. Place second layer on top. Spread remaining frosting over entire cake. Sprinkle top with chocolate shavings. Serve slightly chilled or at room temperature. Can be made a day ahead. Store frosted cake in refrigerator. Unfrosted cake layers can be covered tightly with plastic wrap and stored in refrigerator for one day. Unfrosted cake layers can also be covered with plastic wrap and then with foil and stored in freezer for up to two weeks. Best when eaten within three days of baking. To make a four-layer cake, chill unfrosted layers until very cold or freeze briefly. Slice horizontally across each layer. *Find the Brown Rice Flour Mix under Guide to Flour Mixes on this blog. 1. Combine heavy cream, confectioners’ sugar, and vanilla in large bowl of electric mixer; beat until stiff peaks form. Use pastry bag to pipe sweetened heavy cream around edges of pie. Refrigerate pie until well chilled. Serve cold. What kind of cocoa? Natural or Dutch process? I use natural cocoa. And I typically test recipes with cocoa you can buy in just about any grocery store- like Hershey’s. But if you have a special one that you prefer, it would work well, too. I’m sorry, but I’m not clear on what you mean by “fudge”, as there isn’t any fudge in the recipe. If you mean that you made the cake without the melted chocolate, even with the 2% milk (to add back in a bit of fat), then yes it would be softer because there is less “stuff” in the batter. The melted chocolate takes up volume and rounds out the batter. If the cake didn’t have the chocolate in it, did you replace it with something else? The reason this cake has two eggs instead of four is really only because that is how it was originally calibrated when it was a wheat recipe. When I converted it to gluten-free, I tried to stay as close to the original as possible. The chocolate adds bulk and firmness and if you added an extra egg, along with the chocolate, the extra egg could cause it to become chewier, but yes also firmer. The vanilla cake has equal parts milk and oil. In this cake, the ratio is a little diffenent; it relies on the melted chocolate for some of the fat. As why fat-free milk, it is so I can control the fat content of the recipe through the oil. Fat content in whole milk or 2% milk is never going to be exactly the same across the country, especially when you consider the marginal differences in brands, and organic versus non-organic, etc. It may not vary a lot, but it’s enough that I tried to control for it. If figured non-fat milk would be the most consistent. I was trying to get everyone who makes my recipe on the same page in terms of ingredients to the best of my abilities. If you are looking for a dense, multi-layered chocolate extravagance, the chocolate bundt cake in my new cookbook (The Heirloom Collection) might fill the bill. Or perhaps I’m not understanding. Please let me know so I can better help you. Thank you so much for your thorough response! I made the cake exactly the way it says and yes it was discernibly different in terms of texture vs leaving out the melted chocolate (“Fudge”?). I wondered if that component was an addition like adding chocolate chips where it wouldn’t make a significant difference to the batter, so I wasn’t sure it was “necessary” and thus I’ve experimented with leaving it out. My experience has been that if the chocolate is not cooled enough and the eggs/sugar are too cold, then the melted chocolate clumps up. I was under the impression this was supposed to happen and thus the “fudge” in the title. But when I tested it again yesterday and had the temperatures closer to each other, the addition of the melted chocolate did not yield clumps and I ended up with a nice smooth batter. I have made this cake numerous times both ways, with and without the melted chocolate, and the cake has not necessarily failed without the chocolate; however it is less dense and very light. Gobbled up just the same I might add. Now that I was really paying attention and made it the right way even using fat-free milk I am satisfied that it must be made that way! I would still like to experiment anyway with leaving out the melted chocolate and adding an extra egg. What would that do? I didn’t consider, as you suggest, that the melted chocolate needs to be replaced. Generally I don’t play with your recipes or test anything. I make them as you set them out and trust in them completely. For this particular cake I’ve had these issues because I don’t usually have the right milk (and I’ve wondered if I could thin out 2% with water? but never dared) and I’m sometimes impatient to melt the chocolate as it adds an extra step I’d like to skip! That said, I won’t do it again. With regards to other cakes, I do have the heirloom collection and I know I made a vanilla bundt cake a while back but I don’t remember now if I made the chocolate one. I make the chocolate ricotta muffins and brownies (although I use a 9×9 and adjust time) from the first book routinely. I did wonder why there wasn’t a regular chocolate muffin recipe (although this cake in muffin form works splendidly) and was excited to see a recipe in the new book. However and this is highly unusual, I was not pleased with the result. I made them twice at least and each time the batter was very thick and the resulting muffin was dense and dry. I’m not sure why or if using 2% milk would have accounted for it. Now that I have the fat-free milk I will try them again. Thank you so much for communicating! I’m not good with being on the internet and generally stay off (mainly because I have four children who create a lot of laundry! ), but it’s really nice to be able to reach out. Yes, you’d do have to have the chocolate cooled enough before you pour it into the batter, but I’m not sure your eggs and sugar could ever be cold enough for it to seize up the chocolate. What kind of chocolate are you using? Also, I’m not sure if you watered down the milk if you’d get to exactly what you’re looking for. Might be better to stick with the 2% and just have the cake be a little denser. It sounds like you over-baked the muffins slightly or had them in a pan that contributed to them over-baking. The chocolate muffins in the new book should be very moist. What kind of muffin pan did you use? How dark and think was it? I forgot to mention…. I am testing the recipe in a 6″size to bake a small layer cake for someone. I learned through the food blog “food52″ that an 8-9″ cake would require two 6″ pans. I baked in new anodized aluminum fat daddio pans and tried for 25 minutes at 350. The sides were done but the center was not. I ended up baking it for two-three minutes longer until the center was just set, but perhaps as a result of opening the oven door before the cakes were done, the centers sunk a bit. They were still baked and delicious and using two 6″ pans was perfect to replace one 8-9” cake. The fatdaddio website notes that anodized alum bakes faster. They also suggest that larger sized cakes should bake at lower temp (325) for longer time but reducing the size requires higher temp (375) for shorter time. I wonder what your experience is with regard to adjusting temp/time as a general rule for differently sized pans. Thanks in advance for your thoughts!! I’m replying to myself! LOL Just wanted to add that I spoke to the people at fatdaddio and they said the outside cooked faster than the inside because of the aluminum requiring 25degrees lower baking temp like a dark pan. Recommendation is to bake the 6″ inch at 325 for about the same time as the 9 inch. It should bake more evenly and not be done on the outside before the inside. Will be trying this and can let you know, but I suspect with all your testing, you already know this! I’ve been baking for years and am amazed everyday at how much there always is to learn. He also taught me that to get a domed effect on a muffin you bake at higher temp and to get flatter muffin lower temp. So much to know!! 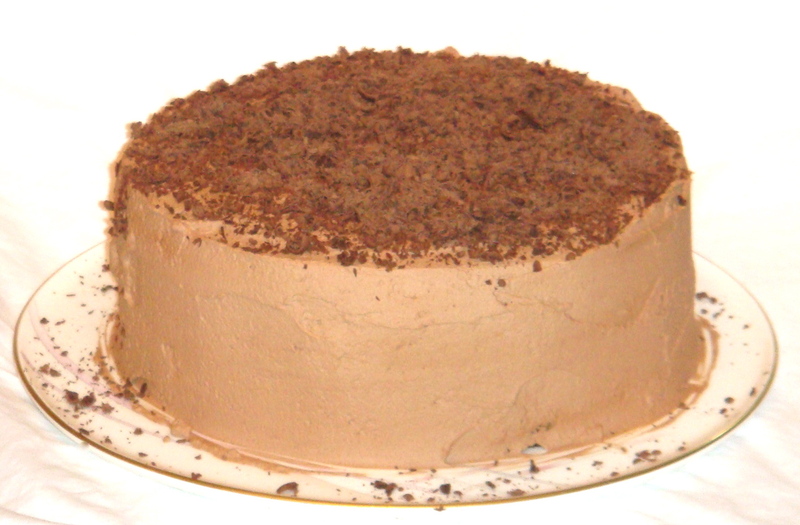 My 6-inch layer cakes always take less time than my 9-inch at 350º. I have aluminium 6-inch pans, but they aren’t super thick. Just kind of normal. Yes – that makes a lot of sense on reducing the time for those pans- at least for you. I have several aluminium cake pans from Nordic Ware, and never have to lower the temperature. Perhaps your pans are really think? Or perhaps your oven is running hot? 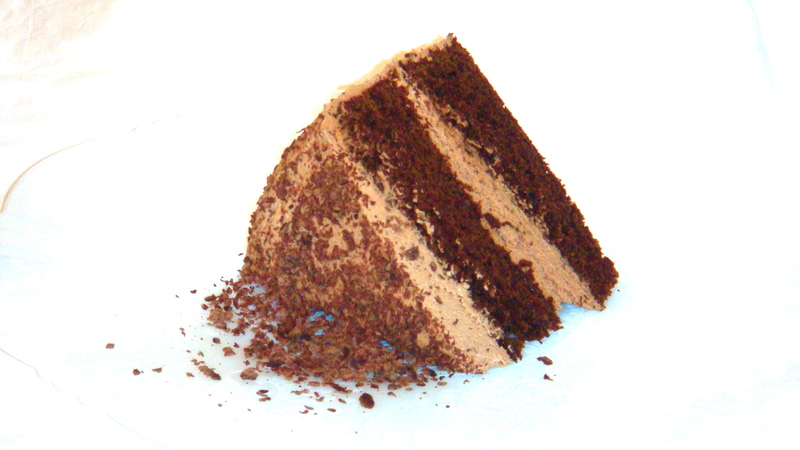 And I’ve made two 6-inch cake layers from by using half a recipe for one of my layers cake. They’re really cute! My oven is new and does not run hot as far as I can tell although I don’t like it so much. I preferred my old one which I had to replace when it stopped working–just plumb retired on me! I’ve had to recalibrate and fiddle with times and convect vs bake to get things right. I’ve given up on convect and just use the bake function. These new pans are not heavy and I was worried because of that. They are light colored so I didn’t think I had to adjust temp. But I did and it worked! They baked perfectly, evenly and with a slight dome shape at 325 for 28 min –I could have probably given them another 1/2 min as they were just done and will try that next time. I have all different pans–Nordic Ware, Wilton, Williams Sonoma, ancient ones with no name!, and now FatDaddio. It doesn’t make it easy for baking as they all bake differently, but I generally don’t have many issues as I account for the differences. I did want to learn how to bake smaller versions of cakes/pies which prompted all this and I have learned so much today. Thank you! With regard to the comment above regarding the new chocolate muffin recipe, I always use the same muffin pans; they’re not marked and I don’t know what brand or metal they are. They are a solid weight, light-colored and not non-stick. I rarely overbake and check at the minimum temp until I know the recipe but maybe that’s it. I remember the batter was really thick so I worried about that. I will try them again with the skim milk to see if that makes the difference and watch the baking time as well. p.s. I’m so rarely out here on the web commenting and I’m sorry I’ve bombarded you today! I so much appreciate all your experience and testing. Please let me know how the muffins come out! The batter is thick and perhaps if you bake them a little less than the time I give, the recipe will work in your pans. My sister, always seems to bake my recipes for less time than I give. I guess it’s a matter of knowing your oven and how your pans work best. When I give times in a recipe, it’s the result of my own tests and those of my field testers across the country (home bakers testing my recipes with their own pans and ovens. That way, I’ll know if the recipe works across a board array of ovens, pans, baker nuance, and geographic climate. NO worries about the comments. I’m here to help to the best of my abilities. I made the Chocolate Fudge Cake morning. It has become my new best brownie recipe because I over beat the batter and just like you said, it fell in the middle. Not to worry because it is delicious and I will make it again and this time beat it on a lower speed. I also made the Basic Sandwich Bread. I am very pleased with the results. The bread leavened up beautifully in the oven and sliced clean and not stick…a real winner. However, I would like to add some fiber in the mix. I have some Teff flour. How much Teff do you think I can add? And how about Flax meal and nuts? I’m so glad you enjoyed the chocolate cake! It is a favorite in my house. And as for adding more whole grain flour to the sandwich bread, I generally follow a simple guideline that I devised based on my testing (I outline all the details in my baking books). In general, for a 2 cup bread, I found 1/4 cup of teff (or other wholegrain) in place of the bread flour mix gave me great results. I can also suggest adding 2 tablespoons ground nuts in addition to the flour mix and up to 3/4 cup chopped nuts. If you use 1/3 cup, it will still be delicious, just a little less high and a tad denser. By the way, I have some wonderful rustic breads that use this ratio in my new book, The Heirloom Collection. For 3 cup breads, I always use 1/3 cup of teff in place of the bread flour mix, but again, you could go a tablespoon more. Again, the bread will be a little less high and tad denser. I can suggest about 3 tablespoons ground nuts in addition to bread flour and about 3/4 cups chopped nuts. I wouldn’t add more than a tablespoon or two of flax meal because it really changes the texture. In some of my multigrain breads (recipes in my baking books), I add a combination of about six tablespoons of sesame, sunflower and whole flax seed. They are delicious! Please let me know if you have an other questions.